Just moved into our retirement house in Snohomish WA. It was built in 1889 and is a cool but hard work project (Nearly finished the kitchen). After much negotiation I have finally found the only place for a layout. Along the side wall of the 'office', above the cloths dressers with a small right turn half above the computer desk. Now trying to figure out how to design a track plan that will have a dock area. Small mining outfit. Logging area. Hope to be able to run and main line loop with connecting short lines for the logging and mining. meaning a full circle of track would be 36" wide measured between the rails. I'm sorry but 24" simply isn't enough. You'll need to extend the 'shelf' to be more of a rectangle than an L shape. Also, your track design appears to have some S-bends. You'll want at least a car-length of straight track before starting a curve that goes the opposite direction to avoid derailments. Well extension is out of the question, this is the maximum area I can build. I understand the tight curves will limit the king of loco I can run. Oh now I'm going to have to sell the 2 Shays, maybe even the climax and one other larger loco. Have to find or build a loco for the tighter radius curves. Good info on the straight before an S.
I agree, put a runaround at each end and have a point to point. Even with the uber-shorty stuff that so many On30 folks (but not me) love, you'll not be able to run loops on an area that small. If my own layout has taught me anything, it's that many (if not most) people at first think On30 is simply HO with larger rolling stock. 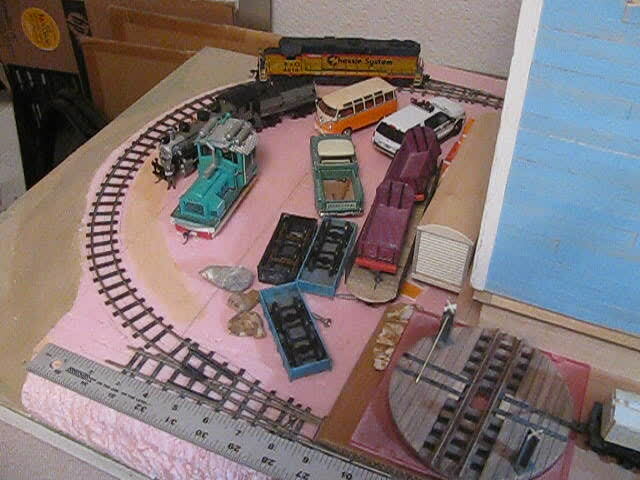 Same concept as On30 but uses HO models on N scale track. There seems to be a growing market for this scale from what I understand. Actually, the little bitty On30 (and Gn15) 4-wheel stuff I build and bash can take 10 and 11 inch radius curves just fine. Even 9 inch radius if you give couplers enough swing. Model Power's HO scale Plymouth DDT 4-wheel diesel is actually an O scale model of a 3ft gauge unit. It has only 1 powered axle, so no grades and short trains is the rule. Bachmann's old NON-DCC and sound 0-4-2 Porter can take those curves too. I don't have experience with the newer one. The mechanisms from things like Grandt Line's 25 ton GE boxcabs are great for bashing in to On30 and Gn15 micro-power. With these curves HO traction and trolleys would be good sources for mechanisms to build On30 locomotives upon. They have been using these curves and sharper for decades. If your rails are laid smoothly some surprising mechanisms will go around those curves and for basis for On30 bashes. Bachmann's HO GP38 for one. And their 4-axle Fairbanks hood unit. 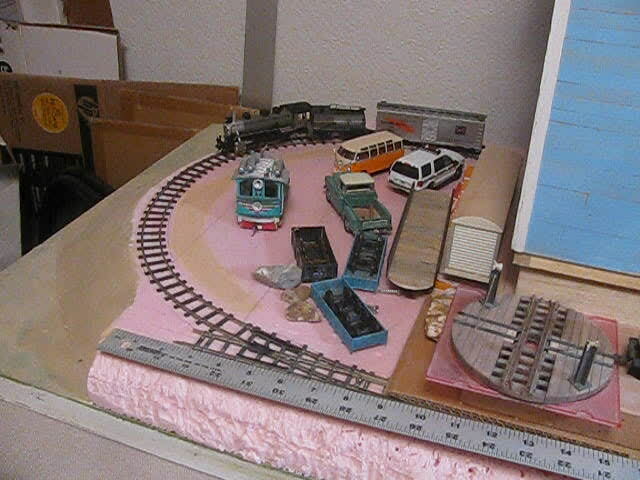 Also good kitbash fodder is their HO 0-6-0 and their HO 6-wheel Plymouth MDT, which is really a WDT. The green and silver loco is a new body on one of those. A standard old blue box HO scale Athearn 40ft boxcar frame will go around super sharp curves just fine. The old Athearn Blue box SW-1500/SW-7 is great. 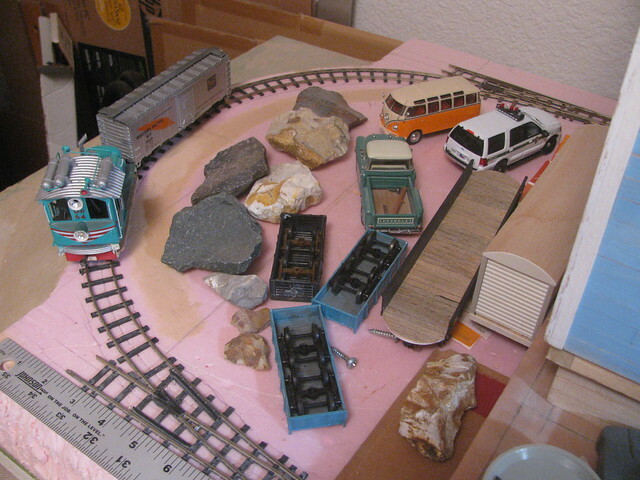 I built several HO traction locos out of those in 1980s and they could do 8 inch radius curves. Like the idea of the critters. Sitting in the office (while the wife is away) I think I can fatten the right end to give me 38" and run the track to the edges. 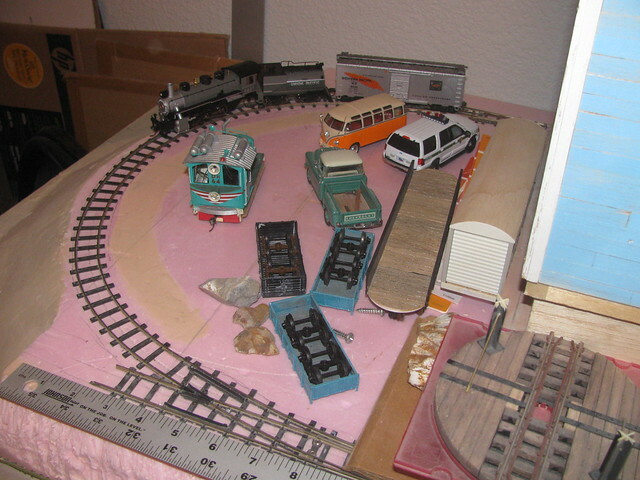 Keeping the loop rail for smaller locos and the larger ones would go to the turn table at the left end. Move the mining right closer to the logging. Then the loggers and miners can have a fight at the local tavern. Sound like reasonable goals to me.